Polycomb Group Proteins is a comprehensive volume detailing the mechanisms that are key to the management of genome function in many different contexts, from embryonic stem cells to terminal differentiation. The book discusses the regulation of cell lineages, cell proliferation, apoptosis, X chromosome inactivation, and most major genome programming choices. In the last few years, the biochemical understanding of PRC1-type complexes has greatly expanded in terms of the number of components involved and the intricacies of their interactions. The functionalities of these various complexes and their components are not all well understood, but recent work has shown an important division of labor and roles in the recruitment of stable binding in the ability to lay the groundwork of histone modifications and in the epigenetic maintenance of repressed states. 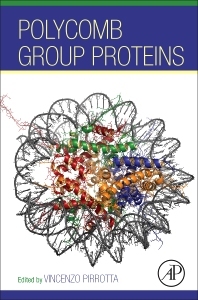 In an effort to provide clarity in this topical research area, the book provides a cluster of chapters that deal with variant PRC1 complexes, their taxonomy, their components, their interactions, and what is known of their functions. Which PRC1 Contributes Most to H2A Ubiquitination? Is H2A Ubiquitination Really Important? What's Next for PRC1 and uH2A? The Role of UTX: H3K27 Demethylation or Not? Does H2A Ubiquitylation Play a Role in Global PRC2 Activity? Dr. Pirrotta is a world leader in the area of polycomb group proteins. He attended Harvard University up to a postdoctorate level studying physical chemistry and molecular biology. He joined the new EMBL Laboratory in Heidelberg, studying gene regulation in bacteriophage lambda and then Drosophila molecular genetics. He proceeded from there to the Baylor College of Medicine, studying developmental biology, gene regulation and chromatin organization. After tenure at the University of Geneva, he joined Rutgers University in 2004 as part of a laboratory that studies polycomb proteins, epigenetic silencers, chromatin complexes, genomics and nuclear architecture.